It’s been said that you can eat and drink for free in DC. That is, you can eat and drink if you know the right people, show up at the right place at the right time and are properly dressed. The opportunites are there and can be to the advantage of one who knows what she’s getting into. There is no end in sight to the emails showing up in my inbox like the one at left. Let’s examine. The sender, Wink, expects that by supplying free booze, people who come out will feel so guilty getting something for nothing that they will buy something they don’t really want. After all, advertising is what makes people who don’t need it buy something they don’t want with money they don’t have. Or so I hear. 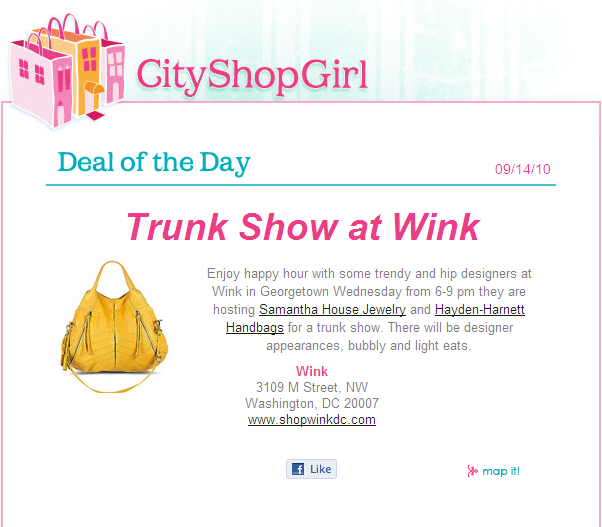 From the words Trunk Show, enjoy, and Georgetown, I already know which kind of clientele the boutique is trying to lure. They are Georgetown types or wish-they-were Georgetown types: long straightened hair constantly thrown over shoulders, purses held in the crook of an elbow, always travels in packs. Further, the use of the word bubbly leads me to believe that this event will appeal to people who use the word bubbly. These are probably the same people for whom a designer appearance would be a draw. After saying all this, far be it from me to turn my nose up at some free sparkling wine and hors d’œuvre. Free booze? I’m there! Previous Post High Heels Are Complicated, n’est-ce pas?